Here’s an easy & simple weeknight winter soup that’s not only kid approved, but vegan and dairy-free, if you omit the parmesan cheese. 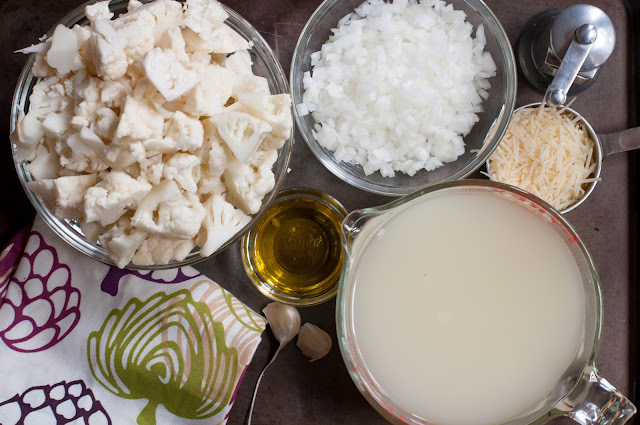 This soup only requires 4 simple ingredients; a head of cauliflower, yellow onion, garlic, chicken or veggie stock. I love this soup because it’s a creamy soup without the cream! Yippee! The cauliflower adds a wonderful creamy texture to the soup, so it’s warm, comforting rich and smooth on the taste buds. 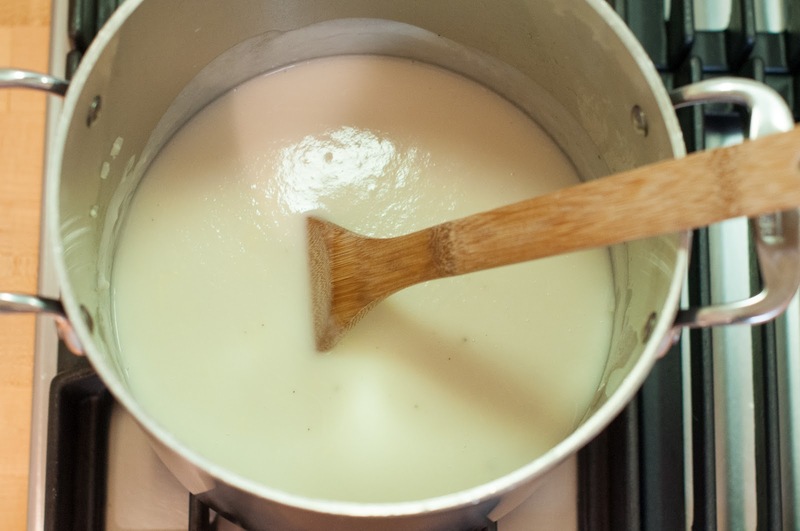 Whenever I make this soup, people always ask me if there’s milk or cream in it, but there’s not, it’s the pureeing of the cauliflower that makes this soup naturally creamy! I love topping this soup with some oven roasted shiitake mushrooms, as it converts this simple plain-jane soup into a gourmet restaurant soup! Delish! I also love topping it with some sliced avocado and chopped raw cashews for some added texture and healthy fats! My kids rates this soup a 10, and they always ask for it when the weather starts turning cool. I usually serve this up with some couscous cakes or chickpea veggie burgers. We also love pairing this soup with a grilled cheese and roasted broccoli sandwich. Total comfort cooking! 1 medium sized head cauliflower – If you get a large head, then you may want to add a bit more stock. 4-5 cups chicken stock or vegetable stock, or more to depending on the size of your head of cauliflower – I used chicken stock – Note: if you use vegetable stock your soup will look browner than my photo, but it will still taste the same. 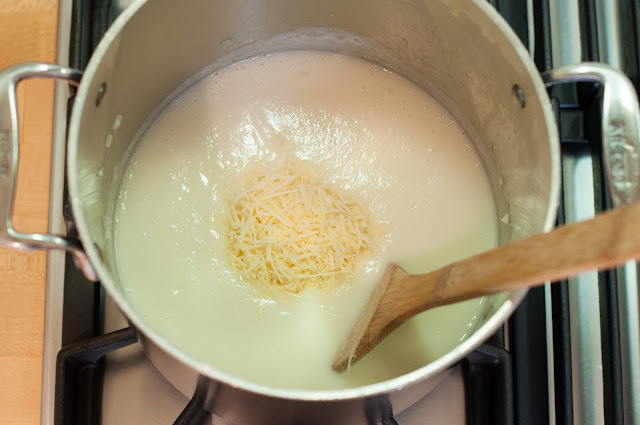 optional: 1/2 cup finely grated or shredded Parmesan cheese – this soup tastes amazing with or without the parm. optional: 1/4 cup raw cashews – cashews add layer of rich creaminess to the soup, as well as some healthy fats – see my note in the recipe below as when to add the cashews. optional: 1 teaspoon to 1 tablespoon fresh lemon juice – Adding and acid at the end can brighten and lift the flavors of a soup. 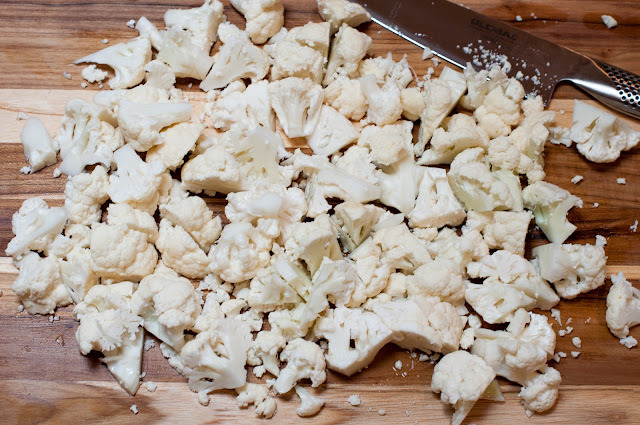 Remove the leaves and thick core from the head of cauliflower, and then rinse it. You can actually use some of the core in the soup, just make sure to remove the leaves. 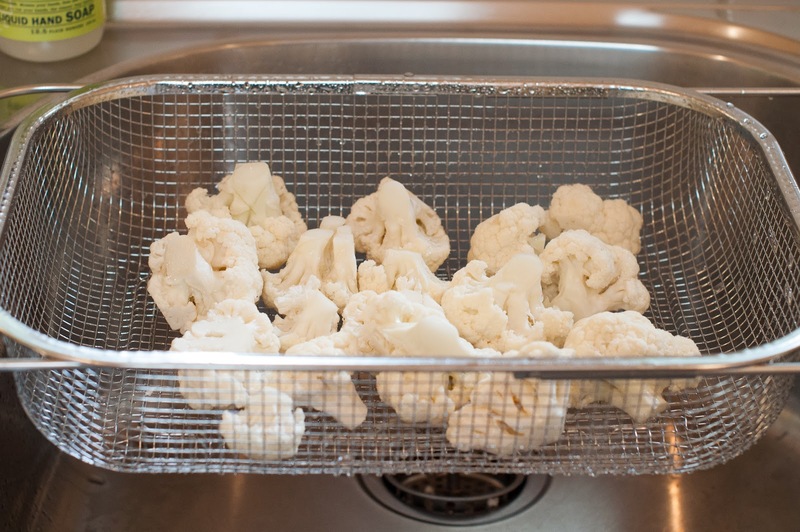 I love rinsing my veggies in this strainer, especially when there’s a lot to rinse at once. Coarsely chop the cauliflower (and core if using) and set it aside (coarsely chop means to just cut up the cauliflower in random sizes). Heat the olive oil in a large soup pan or Dutch Oven over medium heat. Once the oil is heated, add in the onion, garlic and 1 teaspoon sea salt. 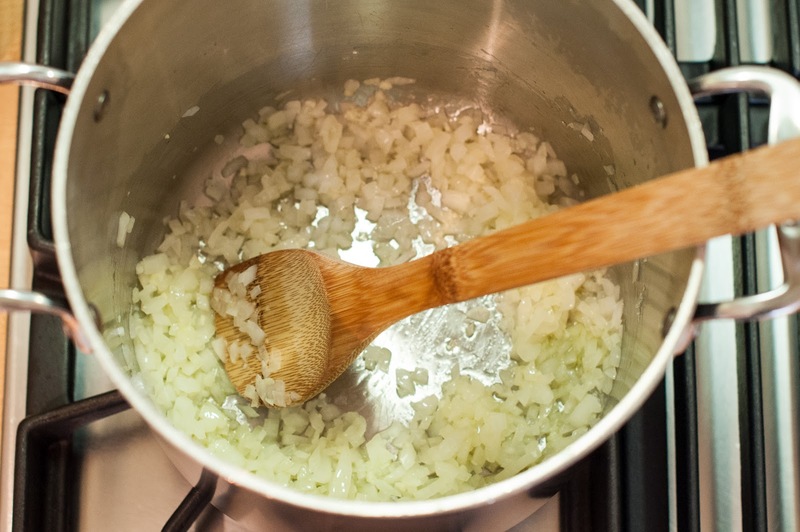 Cook until the onion is softened, but not browned, about 5-8 minutes. Once the onion has softened, add in the chopped cauliflower and chicken/veggie stock, and bring to a boil. You want to add enough chicken/veggie stock to cover the cauliflower. 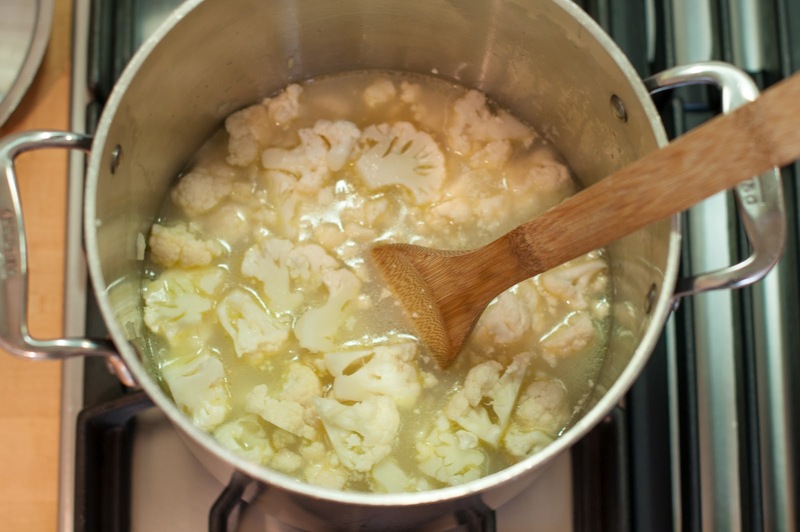 Reduce the heat to simmer, cover, and cook until the cauliflower is very soft and falling apart, about 15-20 minutes. Below is a photo of how it should look. Remove the soup from the heat and puree it using either a blender, (I used my vitamix) or a hand held immersion blender. If you want to add in 1/4 cup raw cashews, now is the time. Add the 1/4 cup (no more as it can be overwhelming) raw cashews to the soup and puree until smooth and creamy! Tip: If you’re using a blender, wipe the leftover pieces of onion and cauliflower out of the pan, so you have a nice clean pot for the pureed soup. Add the soup back to the pot and add in the parmesan cheese, if you’re using it, and stir until smooth. Taste the soup and season with a bit more salt if needed. Please don’t be afraid of using salt, (be sure to use unrefined celtic sea salt) as salt brings out the natural flavors! If you feel the soup’s flavor is too bland for your liking then you can always add in some fresh lemon juice. It helps to liven up the flavor as well. Keep soup warm until ready to serve. Below is the finished product, doesn’t it yummy and creamy? Top each bowl with a bit of parmesan cheese (if using) and some freshly ground pepper. You can also top the soup with some roasted shiitake mushrooms! Try topping your soup with some sliced avocado and chopped cashews! It not only adds flavor and texture, but some healthy fats as well! You could even top the soup with some leftover quinoa or brown rice. I love making my soups on the weekends or during the day while the kids are at school, and then storing them till dinnertime or later that week. It just makes dinner that much easier when all you have to do is re-heat some soup and add some warm crusty bread or a pre-made chickpea burger or couscous cake! These quinoa cakes go amazing with this soup. Here's an easy & simple weeknight winter soup that's not only kid approved, but vegan and dairy-free, if you omit the parmesan cheese. 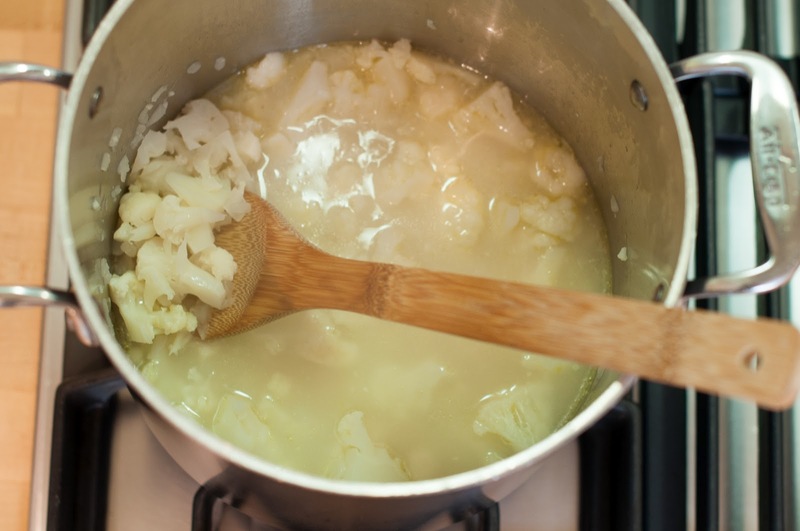 This soup only requires 4 simple ingredients; a head of cauliflower, yellow onion, garlic, chicken or veggie stock. 1 medium sized head cauliflower - If you get a large head, then you may want to add a bit more stock. 4-5 cups chicken stock or vegetable stock, or more to depending on the size of your head of cauliflower - I used chicken stock - Note: if you use vegetable stock your soup will look browner than my photo, but it will still taste the same. optional: ½ cup finely grated or shredded Parmesan cheese - this soup tastes amazing with or without the parm. optional: ¼ cup raw cashews - cashews add layer of rich creaminess to the soup, as well as some healthy fats - see my note in the recipe below as when to add the cashews. optional: 1 teaspoon to 1 tablespoon fresh lemon juice - Adding and acid at the end can brighten and lift the flavors of a soup. Remove the leaves and thick core from the head of cauliflower, and then rinse it. You can actually use some of the core in the soup, just make sure to remove the leaves. Heat the olive oil in a large soup pot or Dutch Oven over medium heat. Once the onion has softened, add in the chopped cauliflower and chicken/veggie stock, and bring to a boil. You want to add enough chicken/veggie stock to cover the cauliflower. Remove the soup from the heat and puree it using either a blender, or a hand held immersion blender. If you want to add in ¼ cup raw cashews, now is the time. Add the ¼ cup (no more as it can be overwhelming) raw cashews to the soup and puree until smooth and creamy! Tip: If you're using a blender, wipe the leftover pieces of onion and cauliflower out of the pan, so you have a nice clean pot for the pureed soup. Add the soup back to the pot and add in the parmesan cheese, if you're using it, and stir until smooth. Taste the soup and season with a bit more salt if needed. Please don't be afraid of using salt, (be sure to use unrefined celtic sea salt) as salt brings out the natural flavors! If you feel the soup's flavor is too bland for your liking then you can always add in some fresh lemon juice. It helps to liven up the flavor as well. Top each bowl with a bit of parmesan cheese (if using) and some freshly ground pepper. You can also top the soup with some roasted shiitake mushrooms! They're amazing! « Spinach Smoothie! Kid rated 10! Jackie, you need to do a cookbook, so I can have all of your recipes in one place! Can’t wait to make the cauliflower soup. Yum, this was good! My 2 and 4 year olds both loved it too… Definitely going to make this healthy soup again. We had it with crusty Italian bread and also some couscous cakes from your blog. Would love to try this soup. I’m nervous about overcooking the cauliflower to the point of it taking on that strong cabbagey smell and taste I experienced in the past with another soup recipe. Do you mind telling me if 15 to 20 generally get the cauliflower soft without that overpowering result? Thank you for your help, Jackie. I’ll give it a go! I’m fighting off a cold today and made this soup for dinner. It was so easy (even when not feeling well) and fast! I’ll definitely be making this again and again. David loved it too. Amazing and simple and the whole family loved it!!!! It’s cauliflower harvest time in the garden, how perfect would this be for dinner soon? You might want to try a bit of freshly ground nutmeg in your cauliflower soup…used with a light hand, it can add a delicious not to cauliflower soup. Great idea Karen. I will try that this week 🙂 Thanks for the tip. Hi Jackie! I made this soup last night and it was DELICIOUS! It was also one of the easiest soups I’ve made in a while. Looking over the pictures, I realize I forgot to add the parmesan! It was still yummy as I topped each bowl with a bit parmesan and chives so maybe that was enough to satisfy my taste buds. Served with a crusty mulitgrain bread, the night was complete! Cheryl, you honestly rock! I love that you made breakfast and dinner from the blog. It truly makes me one happy girl 🙂 This soup truly is the simplest to make and tastes so good! It’s ones of Eli’s favorites. How was the quinoa cereal day two? I’m having a bowl of the cereal right now and it’s just as yummy the second day! I love that the cranberries and raisins get fat and juicy…and the steel cut oats – I’ve never had those before. I now prefer them to regular oats! This looks delicious and I hope to make it tonight for dinner, do you think that you could use frozen cauliflower? Hi Paula. I have never made it with frozen cauliflower, but I’m sure you can. I think it would be best to thaw it first and then drain it really well and then pat dry with a towel. I’m not sure how many bags would equal one head, but I’m assuming one bag would. Give it a try, and please let me know how it turns out! Although my husband says he doesn’t enjoy cauliflower, I know he would like this recipe. It just needs to be disguised. ; ) Sounds wonderful! I look forward to trying this! Hi Vespa. I hope he enjoys the soup. It does taste like cauliflower, but it’s so creamy and mellow that I think he will enjoy it as well. I am making it vegan and I know it will turn out great!!! Yum! Let me know how it turns out for you girl! My husband loves this with pepper jack cheese melted into it. Pepper jack cheese sounds great! This looks so good! You have the best soup making equipment! (I have to get one of those immersion blenders) Your Sunday supper looks perfect. Yaay Wendy! Are you going to try Amanda’s additions to the popovers? I am going to try it myself. Let me know how it all turns out!